Our second beekeeping meeting of the year will be held at the Mazatian Family Restaurant, 1900 Hilco, Albemarle, 28001 ( behind Yadkin Vally Restaurant on Hwy 24/27). The meeting room may be accessed from the back parking lot or you may park in front and walk through to the back room. Order from the menu dinner begins at 6:00 p.m. Since this is our first meeting at Mazatian, please RSVP SCBeeBuzz@gmail.com so I can let the Resturant know how many places to set. FREE continuing education workshop on Honey Bee Health – Pests, Diseases, and Treatment Options. Following is the info sent out with invitations to veterinarians in Union, Stanly, Cabarrus, and Anson counties, which has the agenda on page 2. The North Carolina Veterinary Medical Board has given approval for Union County North Carolina Beekeepers Association (UCNCBA) to sponsor a FREE continuing education workshop on Honey Bee Health – Pests, Diseases, and Treatment Options. This program is being held in collaboration with Anson, Cabarrus, and Stanley county beekeeper associations, on January 5, 2019. Due to recent government regulations, honeybee antibiotics must be purchased from licensed veterinarians. Since some honeybee diseases can wipe out entire apiaries if not treated, beekeepers need your help! You can earn 4 CEU’s in one day. Door prizes will be awarded to four lucky participants! Nancy Ruppert, Apiary Inspector since 2010 for the NC Department of Agriculture & Consumer Services, earned her Bachelor of Science in Nursing from the University of Florida-Gainesville and Master of Science in Nursing from UNC Chapel Hill. She will provide the necessary training of diseases and antibiotic treatment options with regard to veterinary medicine. Please register by visiting our website: http://www.ucncbeekeepers.org and click “Education tab”. You may pack a bagged lunch or lunch will be provided by Hathaway’s Chicken for a fee of $10.00. Please register by December 20, 2018, to include lunch. Registrations will be accepted after December 20, 2018, and at the door, but lunch will not be available after the deadline. We hope you will join fellow veterinarians in this free continuing education training. You may send a representative, but CE hours will not be awarded. Please see the attached agenda. For more information, please text or leave a message. This workshop is for Doctors of Veterinary Medicine. Veterinarians will become familiar with honeybee diseases. Veterinarians will learn the skills to assist apiary inspectors with honeybee diseases. Veterinarians will leave with a clear antibiotic treatment plan to aid local beekeepers. It’s time once again for our three day Agricultural Awareness Days event scheduled for November 6, 7 & 8. We will begin each day at 9 am and will conclude around 2 pm. The event was attended by almost 100% of Stanly County 3rd graders last year. During the event, students rotate through 12 hands-on agriculture stations where they learn about different aspects of agriculture and the environment. We hope that you will join us by volunteering! This event would not be possible without our volunteers and we appreciate all of your help! We will provide lunch and snacks each day for all workers. If you have not already signed up, we hope that you will consider helping this year! We are excited about the event and look forward to another successful educational experience for our third grade students with your help. If you can help with this event, please contact Lisa Forrest by responding to this email or call the office @ 704.983.3987. Please let us know which days work best for you and if you have a station/duty preference! This email arrived in my inbox this morning. It contains critical information on how to protect your hives during storms. I wanted to reach out to all of the beekeepers that have registered with the Driftwatch (Beecheck Program), to remind you to prepare your hives for the approaching hurricane. I have linked two articles below that will aid in this. The first is written by Dr. David Tarpy, and is titled Protective Measures of Beehives During Hurricanes. The second is from Dr. Michael Waldvogel and is titled “Bee” Kind If You Spray for Mosquitos. Both of these articles are good resources for both beekeepers and mosquito applicators. In the event that Hurricane Florence causes massive rainfall and flooding, a State of Emergency could be declared by the Commisioner of Agriculture. If this occurs, the State would authorize exemptions from certain restrictions of aerial applications of pesticides to control the mosquito population. If plans are made for wide-area mosquito applications, I will send out further updates on this matter. Have you seen this? Thanks Ron&Nancy I am forwarding it to everyone. With track of hurricane Florence poised to make a significant impact on North Carolina, there are some important considerations for beekeepers who may be affected by the heavy rain and winds. Please further disseminate to your local network of beekeepers. First, make sure hive equipment is secured to resist strong winds. A simple brick on the top lid is likely to be insufficient to keep the lid from flying off in winds above 50 mph. A lidless hive can cause problems for the bees by introducing moisture and letting heat escape. Strapping the lid down with ratchet straps or securing with duct tape might be in order, particularly for outlying yards. The same is true for hive boxes, particularly if they are relatively new (i.e., the bees have not yet propolized them together sufficiently). 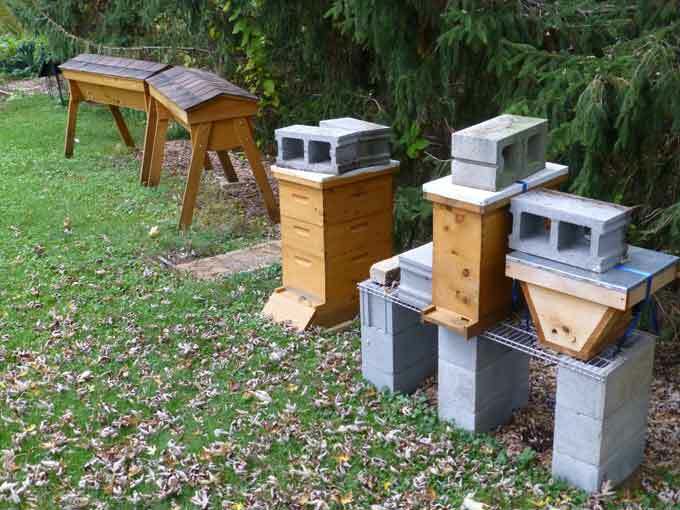 Also consider removing unnecessary boxes (e.g., top-hive feeders) to minimize the wind profile. Second, be sure to have the hives on sturdy stands or level ground. Entire beehives can be blown over by strong winds, particularly when they are fairly tall with many honey supers or are otherwise top heavy. If the hives are on tall or insecure stands, you can move them onto (dry) level ground temporarily to lessen the chances that they topple. Importantly, if you’re using solid bottom boards, be sure to have your hives tilting forward so that rain water does not pool and collect on the floor of the hive. Third, beware of falling trees and tree limbs. These can be particularly problematic for beehives since they can completely crush all equipment and kill the entire colony. It is also hard to prevent with some sort of barrier or cover because of the sheer weight of many trees, so if you apiary is in a wooded location you may need to move the hives temporarily. Fourth, make sure the hives are not in low-lying areas or those prone to flooding. River banks can be useful apiary locations because of their proximity to fresh water, but in flooding conditions entire apiaries can be tragically swept away. Be sure to move any beehives in flood plains until the waters have subsided. Beehives on the ground but in recessed areas can cause water to flood the entrances and may even suffocate the bees if not given an upper entrance. Finally, following heavy rains like hurricanes, various local and state agencies have traditionally sprayed regions with stagnant water to control mosquito outbreaks. While important for public health, such insecticides can be extremely problematic for honey bees. If you are registered through the NCDA&CS through the volunteer program DriftWatch, you will be contacted directly if your beehives are in an area schedule to be sprayed. If you are not registered, however, the state has no means to notify you and your bees may be at risk to insecticide exposure. Please consult the Agricultural Chemical manual for information and advice about how to mitigate exposure to pesticides. Hope your bees stay safe and dry!